Family Ties To Marriott Heirs Pay Off For Romney Hotel tycoons J.W. and Richard Marriott have each donated $750,000 to the superPAC supporting Mitt Romney. The Romney and Marriott families share their Mormon faith — and a friendship that dates back a generation. J.W. 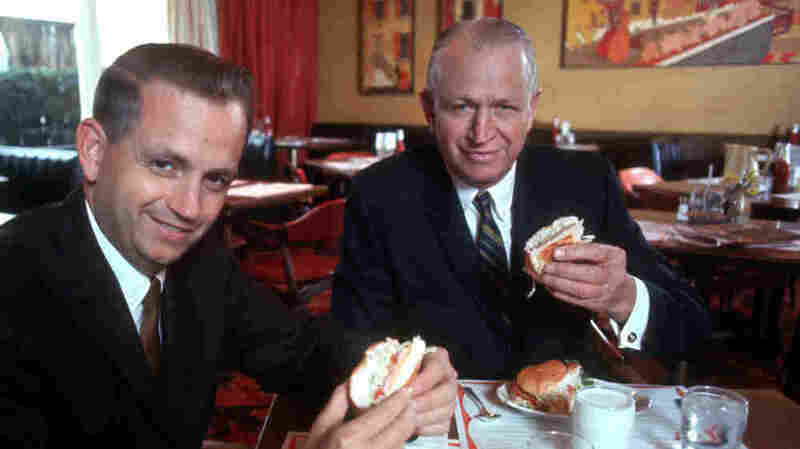 Marriott dines with his son Bill in a Hot Shoppe in March 1969. The elder Marriott was close to Mitt Romney's father, George. The Marriott and Romney families have long been close. The roots of the Marriott family fortune stretch back to a simple root beer stand in Washington, D.C., some 85 years ago. That was where two Mormon transplants from Utah, J. Willard Marriott and his bride, Alice, began selling tamales along with root beer at a stand they named "The Hot Shoppe." From that humble beginning arose a global hospitality empire. The company is no longer in the restaurant business, but there are now more than 3,000 hotels bearing the Marriott name. That growth was due in large part to J.W. Marriott Jr., known as Bill, who convinced his father to get into the lodging business in a big way. "We've just been supportive of him. [If he] wants us to help out on certain things, then we're willing to help." Jeff Beck, a professor at the School of Hospitality Business at Michigan State University and a former Marriott employee, says Bill Marriott made a big mark in the industry. "I really think the mark is driving the Marriott name into all areas of the lodging industry, all market segments of the lodging industry and being a leader in coming up with new ideas," Beck says. 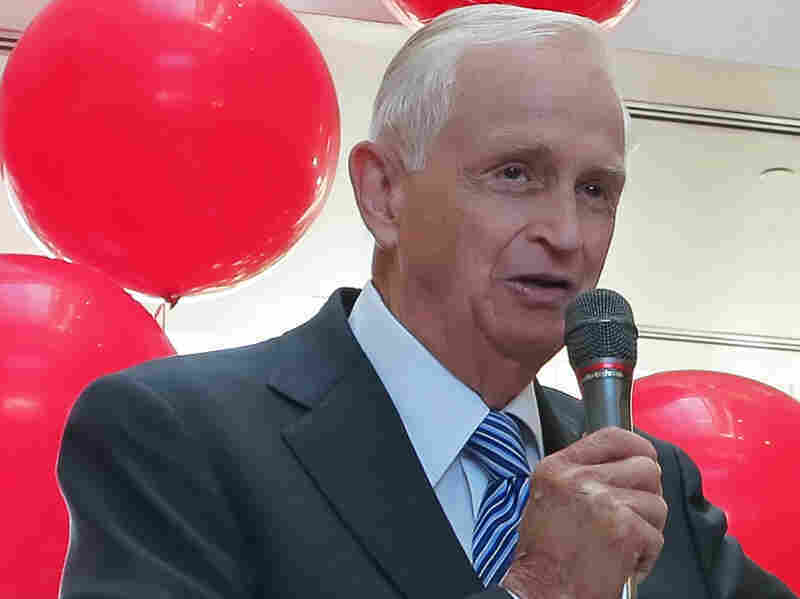 For Bill Marriott, who recently stepped down as CEO of Marriott, and his brother Richard, who leads a Marriott spinoff called Host, being heirs to the family business has been lucrative. Both are listed on Forbes magazine's annual ranking of the 400 wealthiest Americans, each with a net worth of more than a billion dollars. It's unclear whether Romney's stand on illegal immigration matches Marriott's views. Romney has called for "self deportation" for illegal immigrants and seems to have ruled out giving them a legal path to citizenship. But there are deeper ties between the Marriotts and the Romneys. The candidate's father, George, and J. Williard Marriott were good friends — so much so that Mitt Romney's given name is Willard. Romney served twice on the Marriott board. And there is their shared Mormon faith. "The growth of Republican support among Mormons really took off in the late '70s thru the '80s when the Republican Party adopted its social conservative positions on abortion and gay marriage and women's rights and that's where you really saw the cementing of this relationship among Mormons and Republicans," says David Campbell, who teaches religion and politics at the University of Notre Dame. Campbell says a recent survey by the Pew Forum on Religion and Public Life indicates Mormons from both parties like Romney. Bill Marriott gushed about then-GOP candidate Mitt Romney on Bloomberg TV in 2008. "Mitt Romney is viewed very favorably among not just Mormon Republicans — which you would expect — but also among Mormon Democrats. This is a candidate who I think is thought to be an exemplar of the faith and the culture and so has a lot of support behind him on those grounds," Campbell says. Neither Bill nor Richard Marriott was available to be interviewed for this story. But Richard Marriott told The Boston Globe last year, "We've just been supportive of him," adding if Romney "wants us to help out on certain things, then we're willing to help." And during Romney's first run for the GOP nomination in 2008, Bill Marriott gushed with praise during an interview on Bloomberg TV. "I've known Mitt Romney for a long time. He was on our board of directors for 10 years. He is extremely capable, competent, honest and a great family man. I think he'd make a terrific president. He's a wonderful leader and he's very bright and smart. He understands how to make decisions and gather the right information, and to me he's a very inspirational strong leader," Marriott said. But Marriott recently had some political advice for Romney. He told The Associated Press that Romney's message is too complicated and that his 59-point economic policy needs to be simplified. "People aren't going to listen to 59 points," Marriott told the AP. Referring to the centerpiece of Herman Cain's campaign, Marriott said, "they want 9-9-9."